It’s been confirmed how world middleweight king Gennady Golovkin will fight on May 5 in Las Vegas – at The MGM Grand – but we still do not yet know who Golovkin’s challenger will be. GGG, who will be making his 20th world middleweight title defence (if he wins, he will tie the overall record, currently held by Bernard Hopkins) has seen a number of fighters raise their hands and call for the shot that became available when Canelo Alvarez was busted for, well, you know what for. Unbeaten 154 pound prospect Jamie Munguia was the front-runner to get the big fight opportunity, but the untested Mexican has been ruled out by the commission. Demetrius Andrade and Sergiy Derevyanchenko, along with O’Sullivan are, seemingly, the remaining three fighters being looked at (unless another, wholly unexpected fighter winds up getting the shot) for May 5. My bet is exciting, fan-friendly warrior O’Sullivan gets the date. But can the 33 year old from Cork, who is 27-2(19) give Triple-G a fight? O’Sullivan can bang, he has good speed, he has plenty of experience (not at elite level, but at world level nonetheless) and “Spike” is a pretty big 160 pounder. 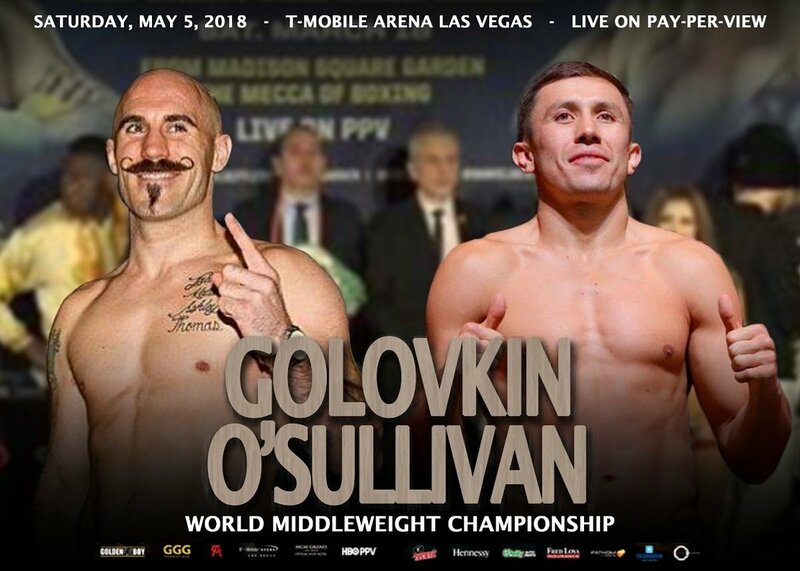 If he does get the gig, O’Sullivan will no doubt enter the ring as a big underdog, and rightly so, but unless he freezes or is blown away fast, O’Sullivan might just bring the heat of battle right to GGG and, for a few rounds at least, give the world ruler a fight and the world a thrill. O’Sullivan has lost the two thus far biggest fights of his career – being widely decisioned by Billy Joe Saunders back in a WBO international title fight of 2013, and being corner retired after seven-rounds of a 2015 fight with Chris Eubank Jr. – but in his last fight, in December, O’Sullivan looked fantastic. Stopping classy middleweight contender Antoine Douglas inside seven-rounds on the Saunders-David Lemieux card in Canada, “Spike” may well have boxed better than ever. Whether the proud and game Irishman has enough to have a shot at hanging with GGG, or of actually beating him (now wouldn’t that be an upset!) remains to be seen. But we may see on May 5. The good news is that Golovkin, 37-0-1(33) and for many the best fighter on the planet, is still fighting on May 5. Against anybody.